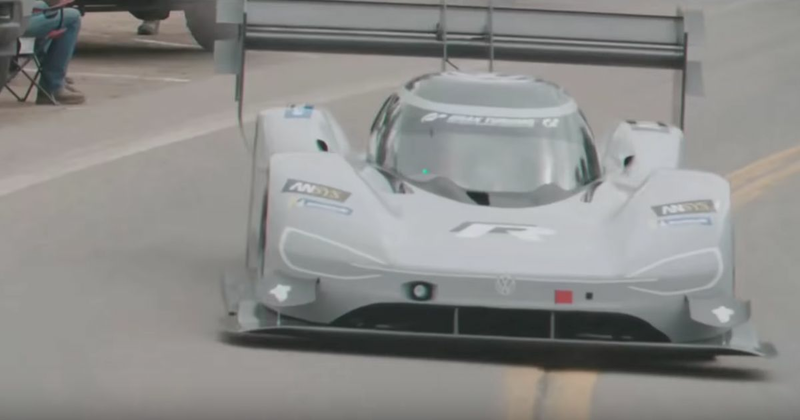 The fearsome Pikes Peak International Hill Climb has a new record holder: French Le Mans winner Romain Dumas, who did the deed aboard VW’s bonkers fast ID R. The time? Seven minutes, 57.148 seconds - some 16 seconds that the previous outright record set by Sébastien Loeb and the Peugeot 208 T16 in 2013. But you won’t get a decent impression of the speed of Dumas and the ID R from VW’s own video from the event (below), which is all aerial shots, Hans Zimmer-style orchestral music and deep voiceovers. Nope, you want to look at road-side footage like the Twitter-posted video above. Doesn’t it look astonishingly fast? The purpose-built race car is powered by a pair of electric motors, giving an output of 671bhp and 470lb ft of torque. Plenty in a car that weights around a tonne. 0-62mph is predictably brisk: it’ll do it in under 2.25 seconds. Now we know the ID R can last for at least eight minutes at full chat and going uphill, we can’t help but wonder how fast it might go around the Nurburgring. Well, VW hasn’t announced any future plans for the thing, so why not?